September 11, 2013 Evenstar Saima5 Comments on Kimi: Now it is done! Kimi: Now it is done! Now it is done! I’m happy to tell you all I’ll go back to Ferrari. I have been there before, I won the world championship with them back in 2007 and I still know the team very well. We have been talking to them for a while and finally everything is signed and sealed. For the second time in my career, I will be a Ferrari driver. I’m very proud of making a comeback to the Maranello outfit. Now we just focus on this season. There are seven races to go, so we have seven races more to get good results for Team Lotus. I will try my very best to finish this season in the best way possible. Well, if nothing else, atleast we’ll get to see some fastest laps big time! Call me crazy but I honestly believe that Kimi was helping Massa in 2008 by allowing him to beat him – I honestly think Kimi was doing this as a pay back for the compliment in 2007 (i.e. help from Massa). To me, that is the best explanation for soooo many fastest laps in 2008 (I think 10)! If he’d been as selfish as some of the other drivers, he could’ve won WDC again in 2008 much more easily than 2007. Hamilton wasn’t all that great in 2008 – remember he rear ended Kimi in the pits in Canada because he apparently did not see the red light at the pit exit. I wish Kimi had won the title again before Ferrari – I guess, now, at best, it will happen together :). Good Luck to Kimi! Personally, I don’t really care much for Ferrari. They have not driven ‘fairly’ in the past, what with the FIA in their back pockets and, of course, biased F1 rules that seemingly helped them to win so many races – all at the detriment and expense of most of the other teams. And may I remind you that it was Alonso and Raikkonen who were in those other teams at the time. But thankfully, the Schumacher era is apparently gone, as is favoritism within the FIA, but the scars remain. Fact of the matter in this case is whether they (an Alonso/Raikkonen pairing) can defeat Vettel in 2014; that remains to be seen with new V6-powered cars. Or will history repeat itself and we instead find ourselves with front row seats to the biggest cockerel fight in the history of the Ferrari hen-house? Congratulations to Kimi! I can sensed that he is really happy & that is the most important thing 🙂 I guess no one would expect Kimi will return to Ferrari when he was leaving in 2009 (heart breaking extremely bitter memory). I’m so proud that Kimi return in much higher recognization. I really hope Kimi will win another WDC with Ferrari & help the team to win the WCC champion in 2014. Congratulations! 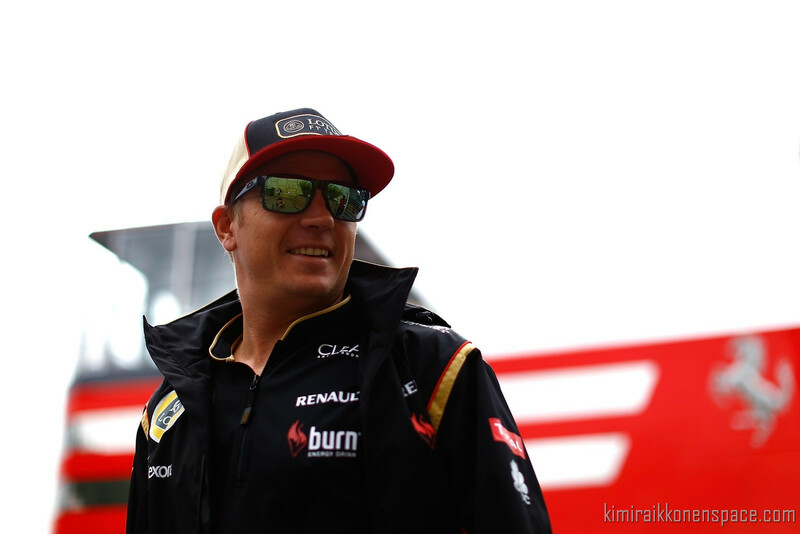 It makes a bit mixed feelings, but when I see Kimi´s lucky face, I know – everything is all right!! Good luck, Kimi – the titles are waiting for a winner!